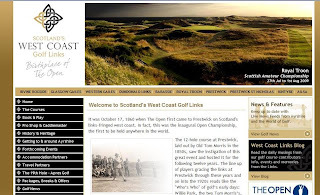 The launch of Scotland's West Coast Golf Links website is immiment. The website which will feature all of the information anyone planning a golf visit to Ayrshire could ever wish for will have its soft launch at the annual Prestwick Travel Trade Golf Day on Monday 30th of March. The website and indeed the full project will be formally launched at VisitScotland Expo where the group are sharing stand space with other operators from Ayrshire. The new site it is hoped will become an invaluable source of information, offers and news for anyone - trade and consumer - visiting the West Coast.